Upregulation of lncRNA-APC1 by APC. Expression of APC in the indicated cell lines transfected with control or WT APC vector, as measured by qRT-PCR (A) and Western blotting (B). (C) Number of altered lncRNAs in the indicated cells examined in 2 independently repeated lncRNA microarray tests. (D) qRT-PCR verification of lncRNAs potentially regulated by APC. (E) Expression of lncRNA-APC1 was detected by FISH. Scale bars: 20 μm. 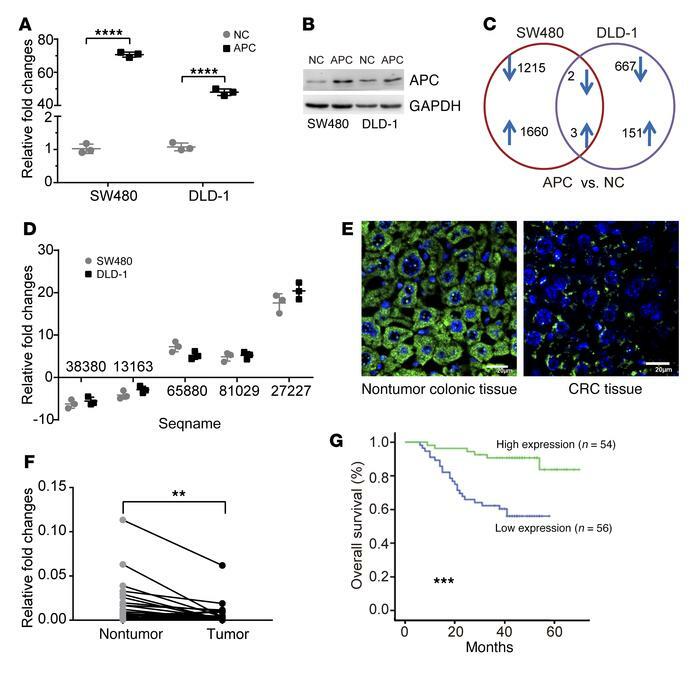 (F) Relative expression of lncRNA-APC1 in paired CRC primary tumor tissues and nontumor colonic tissues (n = 30). (G) Kaplan-Meier survival analysis of patients with CRC (n = 110) according to lncRNA-APC1 expression (cutoff value is the median). Experiments in F and G were repeated twice with similar results. Data in A, E, and F represent the mean ± SD of 3 separate experiments. **P < 0.01, ***P < 0.001, and ****P < 0.0001, by independent Student’s t test (A and F) or log-rank test (G). NC, negative control.